Nosy and sometimes spooky, but I love them anyway. 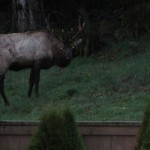 Elk are a constant visitor on my property (no, I won’t give out the address). 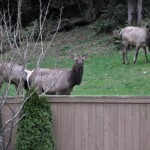 The Roosevelt Elk we have here in the Northwest are the largest of the elk species. Bulls come in at a half a ton and almost 10 feet long. Throw in the antlers and your looking at 10 feet tall (5 feet at the shoulder.) You have to get close in order to get a true appreciation of just how big this deer is. I’m fortunate enough to have this experience throughout the year. I love to take photos with the flash in the evening or early morning – it really highlights the glowing eyes.